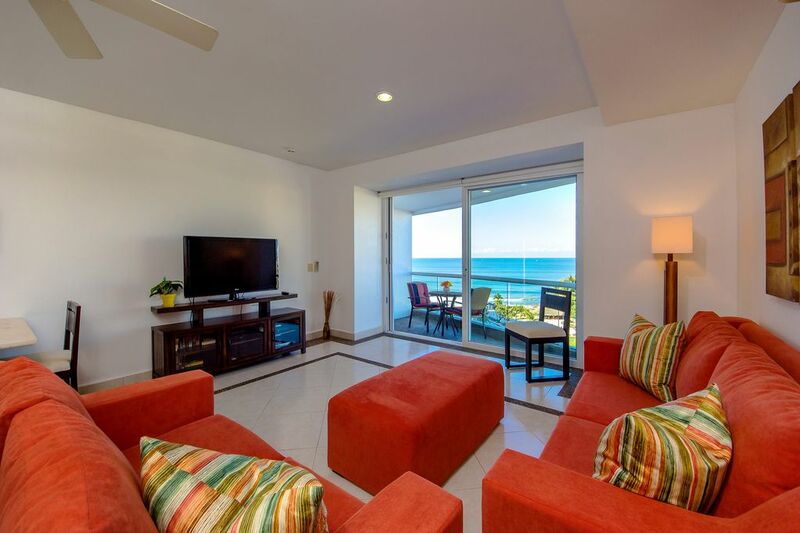 Disfrutar de su estancia en el Villa Magna, residencias condominio frente al mar y el complejo de 5 estrellas. Este lujoso condominio de un dormitorio frente a la playa se encuentra en el condominio del piso séptimo # 373B, con impresionantes vistas del océano y las montañas de la Sierra Madre. Usted tendrá acceso a las instalaciones del sitio en Dreams Villa Magna complejo de 5 estrellas, y tienen la opción de añadir todos los días incluido para su estancia. Dando un paseo por millas de playa de arena o sentarse con los pies en la arena en la playa bar. Hay cinco 5 estrellas restaurantes temáticos a nivel internacional en la propiedad, 3 bares y un bar de sushi en la azotea. El servicio de habitaciones y servicio de catering están disponibles a pedido del complejo hotelero. Ofrecemos todo lo que necesita para disfrutar de su estancia, incluyendo las características de una cocina completa acabado en granito y acero inoxidable, una cama king size de lujo, TV LCD, DVD, cable, conexión inalámbrica a Internet, barbacoa y muebles de jardín para disfrutar de una cena al aire libre . Participar en excursiones diarias para tirolesa, nadar con delfines, avistamiento de ballenas, etc que se pueden reservar excursiones en el mostrador. O disfrutar de los acontecimientos diarios gratuitos, tales como clases de yoga y los espectáculos nocturnos. Villa Magna está situado cerca de muchas de las bellas y populares atracciones de la Riviera Nayarit. Hay tres campos de clase mundial de golf muy cerca. De compras y de vida nocturna están a sólo 20 minutos de Puerto Vallarta. Es sólo un corto paseo de Paradise Village Mall, donde encontrará restaurantes, tiendas, un supermercado y un club nocturno. Muy cerca de Paradise Village Mall, donde hay un supermercado, restaurantes, club nocturno y taxi de agua a la ciudad. Walmart también está cerca. Stayed for a week at this property. The view from the patio is absolutely amazing, beautiful sunsets. We were very pleased, it was so comfortable and very clean. Had all the comforts needed when on vacation. The bed was so comfortable, and had lots of towels which are needed in a hot and humid climate. Would not hesitate to rent this property again, if the owner would have us. George was great to deal with, answered our questions right away and was there to greet us when we arrived. Can’t wait to get away to Villa Magna again. Great condo with spectacular views that you have to see to believe. My husband and I could not quit taking pictures. Very clean condo and owner was very accommodating.. Only negative, was hoping to get an actual real grill for barbecuing on the deck, it ended up being an electric grill. Highly recommend this condo! The condo was perfect, very clean and comfortable with a beautiful view of the pools, ocean, and sunset. Would highly recommend it! We loved this condo. It was well equipped and had everything we needed. Most importantly the views and the resort are spectacular. Thanks George for helping us have a great vacation. We have stayed in the Nuevo area for the past 4 years, and this is the nicest condo in which we have had the pleasure of staying. The condo is very spacious for a one bedroom unit. It was very clean and well furnished. The kitchen is well equipped and there is even a small grill that can be used on the deck. Everything is of top quality including the comfortable bed and living room furniture. Two of the 3 pools are heated to a delightful temperature. There are pool aerobics classes, zumba, and a yoga type class that are all available free of charge. There are many good reasonable restaurants within a 15-20 minute walk down the VERY safe walking/bike path. The beach has soft sand that can be walked for miles in either direction. The water here is swimmable as the bottom is smooth, not rocky. The owner was very easy to work with and was very responsive to my requests. We were here for one month, and the time flew by. We are already looking forward to returning next year. Spent one Month in this wonderful , exceptionally clean Condo ! The Unit is very well appointed , Decor and Furnishings are high end , light and modern , which gives the appearance of a much larger space . Kitchen is fully equipped including Kettle , Toaster, new Coffee maker, Blender .and a great Washer and Dryer Bedroom has a good quality King Bed..very comfy , with a second TV . Great WiFi , and Large Flat Screen TV in Living Room .The owners could not have been more helpful and friendly. The resort has the option of All Inclusive by the Day or the Residents Snack Bar, where prices are extremely cheap for good food and Happy Hour Drinks . Lots of restaurants just a short walk away. Walmart and Mega a short cab ride for groceries. Beaches are great for swimming and walking. One of the nicest condos we have stayed in at Villa Magna and would definitely stay again.